This is a post I wrote back when this blog was still Love Our Disney, in February 2014, as an opportunity through Mom Select and Disney Parks. All opinions are my own. Several years ago I threw a Disneyland themed party. It was a total blast. As we are looking to celebrate my oldest’s 8th birthday this month, I thought it would be fun to look back on this party for some inspiration. This party was a lot of fun and transported our guests to the Happiest Place On Earth, hopefully it can help you do the same. We also had Hidden Mickey Cupcakes. There are a few tutorials floating around pinterest. I didn’t have any extras to cut open to take pictures of, but that is okay. They turned out pretty cute. My sister made Mickey Mouse chocolates for the party using THESE molds. She makes the best chocolates and I owe her big time for making them for us. We had Mickey shaped tortilla chips I made following this tutorial from Bento for Kidlet. We also had Mickey Mouse shaped chocolate covered pretzels found at Target, and other random Disney inspired foods. 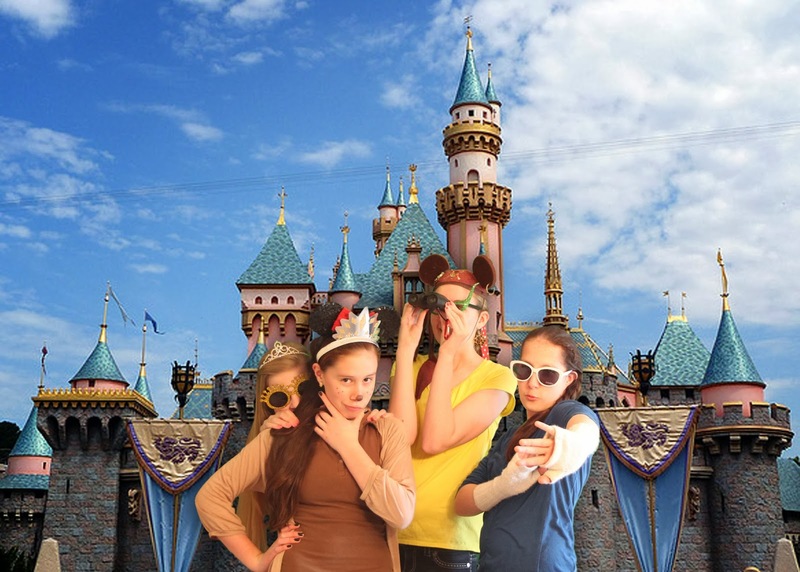 We wanted our guests to feel like they had toured Disneyland Park when they left the party. So we made sure to have activities to represent the different lands. 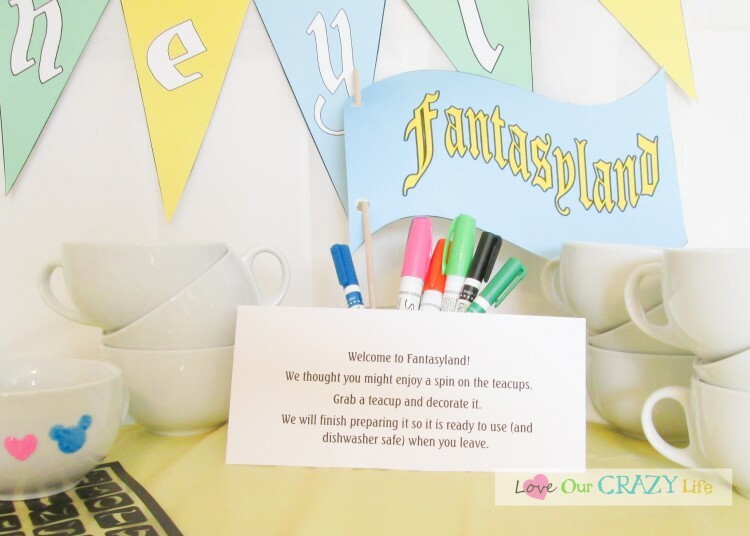 Our major activity was based off of Fantasyland. I think when people think of Fantasyland they think of the tea cups. So, I ordered porcelain mugs that had a teacup shape off of Amazon (after searching every dollar store and not finding any). We decorated them using Oil Based Sharpie Markers. (If you do not use oil based ones they will not be dishwasher safe). The set of 15 off Amazon linked a moment ago is the best price. At Hobby Lobby they did not sell multi packs and they ran $4/each. Once you are done decorating, load all the teacups onto a cookie sheet, etc and place them in a cold oven. Turn the oven on to 350° and let the cups warm up with the oven. Leave them in for 30 minutes and then turn the oven off. LEAVE the cups in so that they cool down with the oven. Pulling them out while hot may cause them to crack or break. Now you have a tea cup all ready to use. When we were in Disneyland in November 2013, the Innoventions building had Disney Infitinity set up for you to play. We thought this would be a great way to entertain the older kids who were attending the party, and also a great representation of Tomorrowland. We set a timer for game play so that everyone would get a turn. For Frontierland we decided to see how well our guests could shoot a gun. 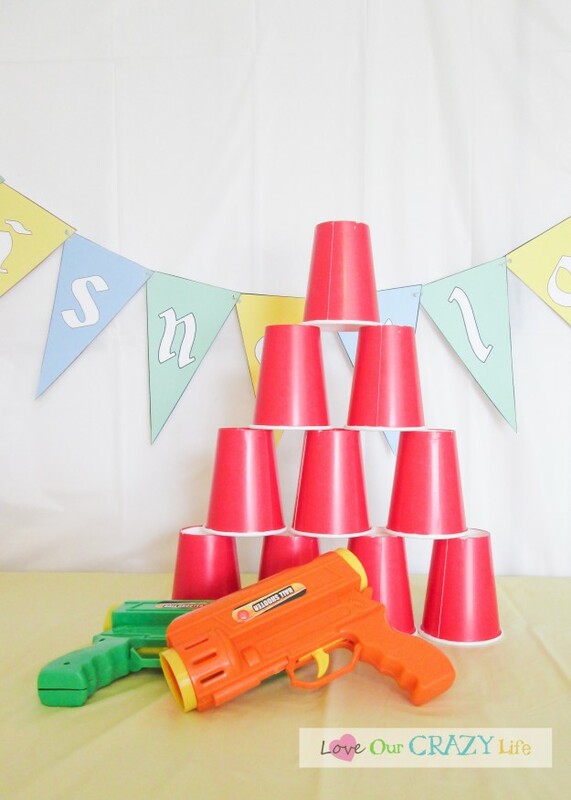 They were asked to shoot over the cups and afterwards they were given a prize. One of our favorite parts of Disneyland is meeting the characters. Since we couldn’t fly all of the characters to our party, we asked all of our guests to come in Disney Bound outfits. (If you don’t know what Disney Bound is, check it out on pinterest or go to the Disney Bound site on tumblr). You can check out my Disney Bound Outfit on my instagram HERE. 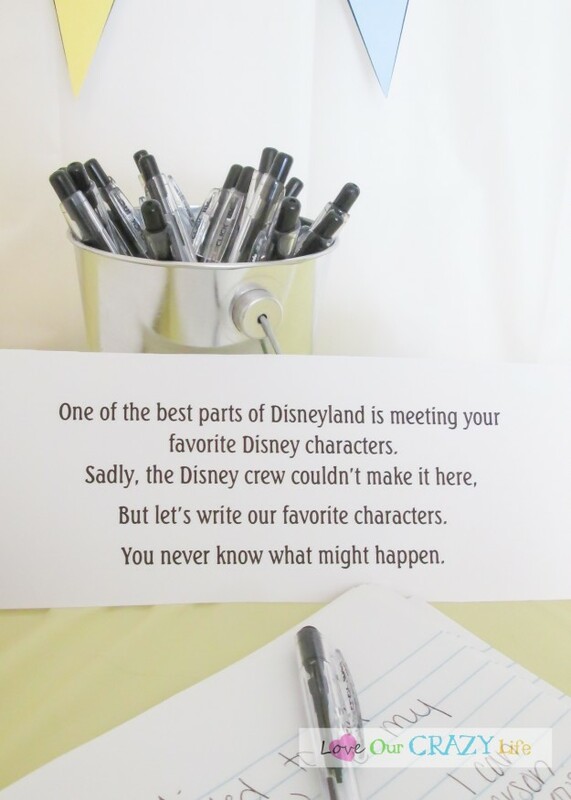 We also decided to have each guest write their favorite Disney character a letter. If you do not know, you can write your favorite character at either Disneyland or Walt Disney World a letter, with your address at the bottom, and they will send you back an autographed post card/photo. We did not tell our guests exactly what to expect, but we let them know they may get a magical surprise from doing this. 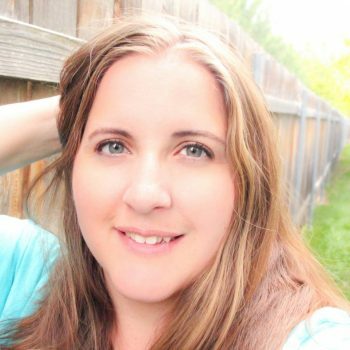 If you want to know more about writing your favorite characters check out this post from Couponing to Disney. Of course, there are two other things you must have before the end of your vacation. The first is a souvenir shirt. Hanes was awesome and sent us T-Shirts and Fabric markers in our kits, so we let the kids go at them. We thought about doing stencils, etc but we decided instead to let them do whatever they wanted. Some of them turned out really cool. Of course, no trip to Disneyland would be complete without a picture in front of the castle. I went back and forth on how to do the picture. I thought about ordering huge prints, but none were as big as I wanted, and the cost was outrageous for a good quality print. I finally decided that I would use a green screen and then photoshop the castle in. I knew it would look corny, but I still love how it turned out. I hope our guests had an amazing time, I know our family sure did. I loved seeing how creative everyone was with their outfits, and it was fun that they all had a good amount of stuff to take home with them. Adventureland- hide animals around the party, stamps, letter boxes, that you would find on the Jungle Cruise and have the guests find them. The one to either complete the task first, or find the most (depending on the specific items used) wins a prize. Mickey’s ToonTown- make your own Mickey Ears. 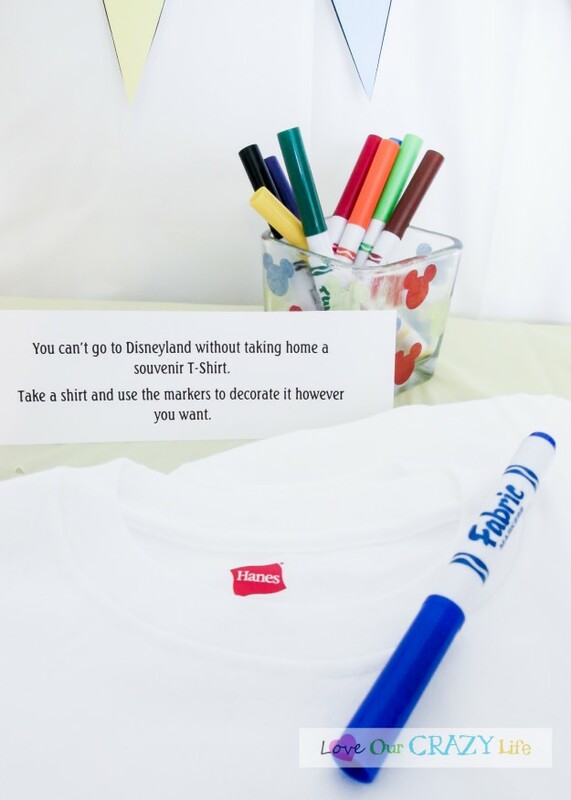 You can find lots of patterns online or you can print out a Mickey head and let them decorate them how they want. New Orleans Square- have some yummy cajun cuisine. Not your thing? Have a treasure map and search for hidden treasure to represent Pirates of the Caribbean. Mainstreet USA- We used our photo booth to represent Mainstreet USA but another great activity would be making Carmel Apples. 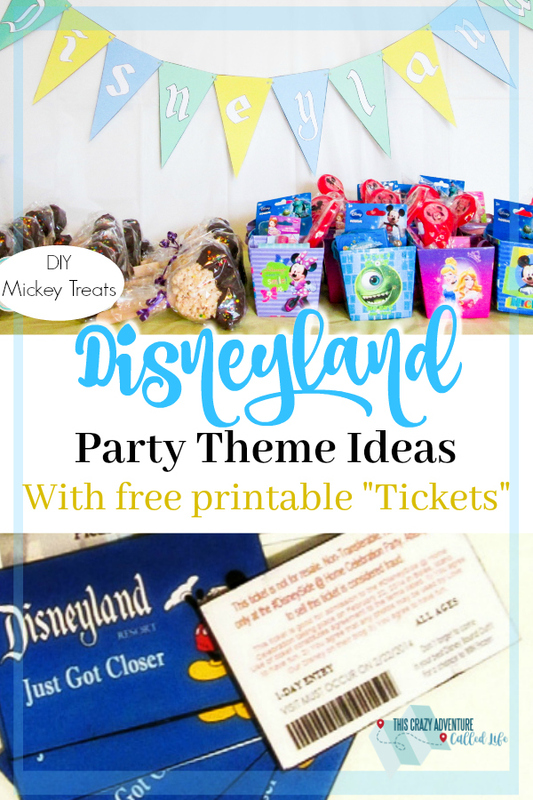 If you are wanting to throw a Halloween themed party, Britni at PlayPartyPlan has a lot of great Disneyland Halloween Party ideas. 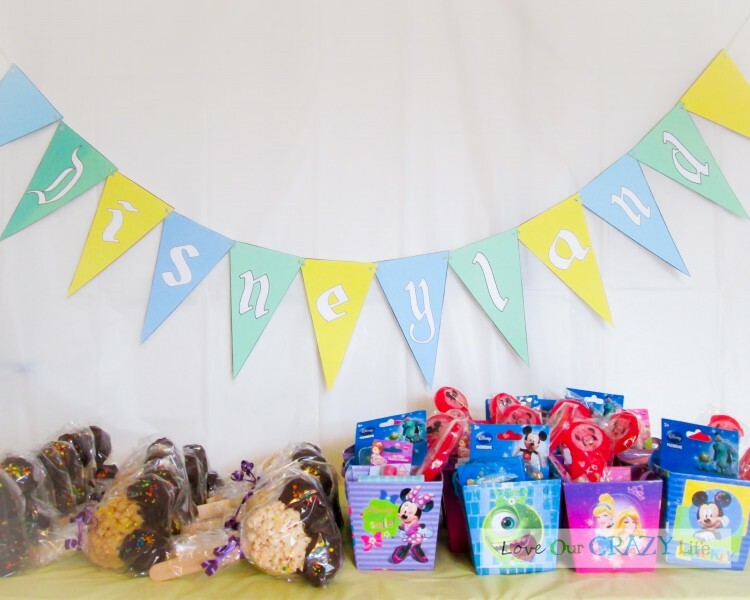 What was your favorite part of our Disney Side party? 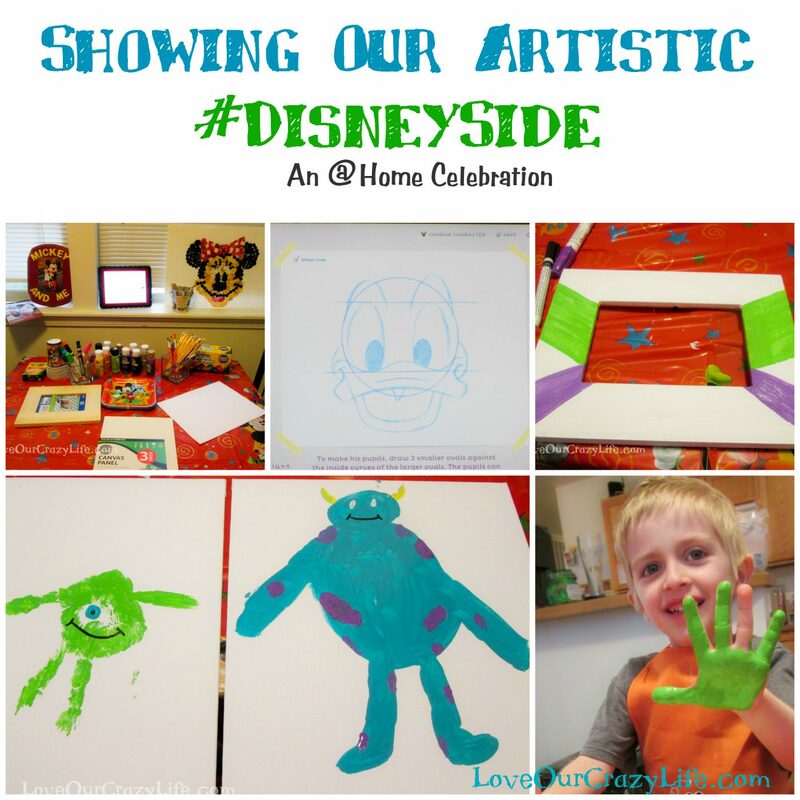 Don’t forget to follow the hashtag #DisneySide to check out all the other fun parties. *This was a post through Mom Select and Disney. 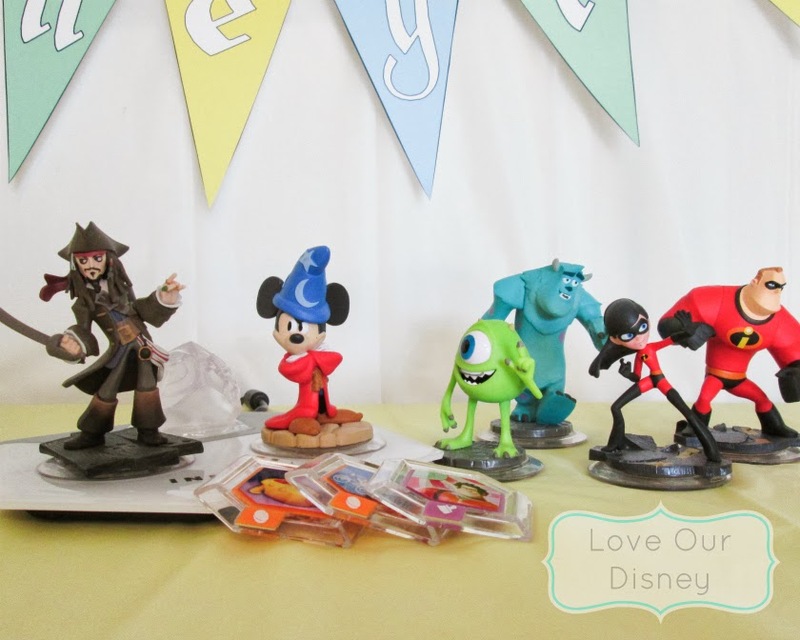 I was sent free product to host a #DisneySide party from Disney and their sponsors, including American Tourister, Hanes, HP, The Chew (on ABC), and more. 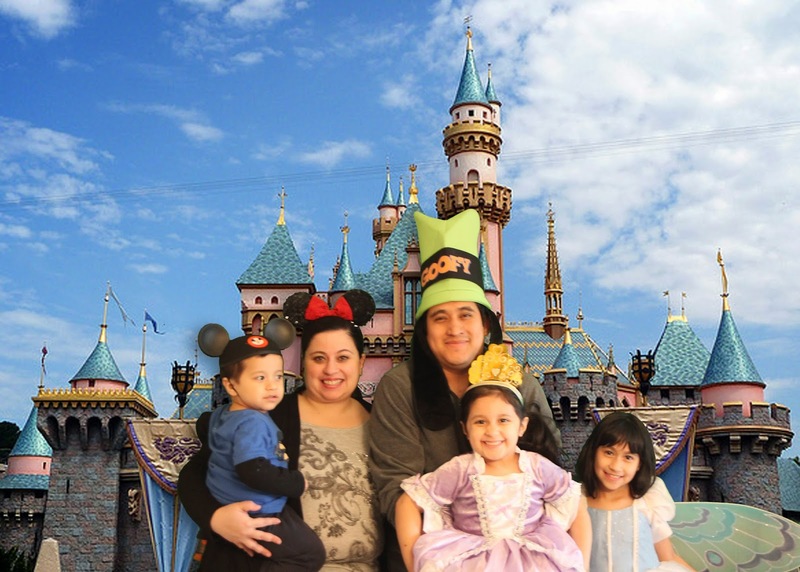 Book your Disneyland vacation today with our partners at Get Away Today. You can use code CrazyAdventure to save an extra $10 on packages of two or more nights and two or more park tickets. « How Accurate Are Disneyland Height Requirement Markers? Your party looks like so much fun! I love the teacup idea and the pictures turned out SO cute! Thanks Heidi! I think the pictures turned out great. Only thing I regret is my family was so busy, we never got a picture in front of the green screen. Looks like an awesome party. I love the green screen idea! You did an amazing job! I love all the little details that helped your guests really experience what it would be like to spend the day at Disneyland! Thanks Lisa! Yours turned out awesome too. Love! Love! Love the green screen photos. Cheesier the better I say. The kids definitely had fun hamming it up for the camera. That is for sure. This is awesome! I’m doing food throughout the Magic Kingdom for my party. It’ll be Saturday. I thought about games/ activities like this, but ran out of time! How do you use a green screen? 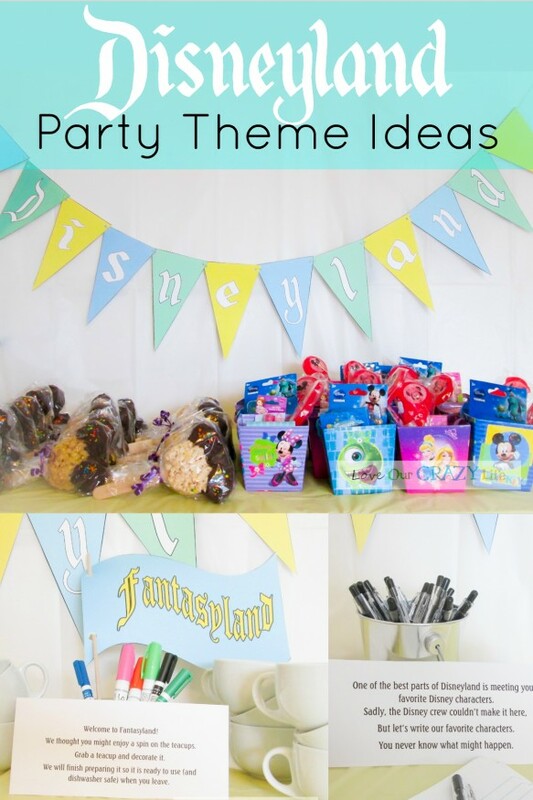 I am having a Disneyland themed party as well! I’d love to do that! It is pretty in Photoshop. (You can get a free trial if needed) there are YouTube videos on how to do it but you basically take pics in front of the green screen then in Photoshop layer the green screen photos over a park photo and then erase the green. Then merge the layers and save.